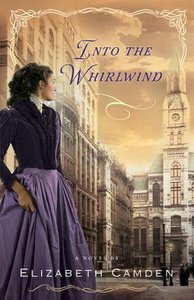 Customer Reviews For "Into the Whirlwind"
The characters in this novel were very well developed and I relished every opportunity I had to cuddle up with this book. I enjoyed the historical reference to the Chicago Fires, and appreciated the insight into immigrant life and pride during that era. Lovely, clean and uplifting. I have become a fan of Elizabeth Camden's work, and this novel was a good one, although not without a couple of minor problems. I think it was a little on the long side, the Christian element seemed a little forced, and at times the storyline seemed to jump awkwardly between threads. Mind you, there was a lot to cover and it did fit the disjointed sense that must have existed after the Chicago fire which is the historical centrepiece of this novel. Ms Camden has a wonderful way of making me like her male protagonists. They are frequently giant, loud, brash bears of men, not a type I normally find appealing, but with the soft centres she brings to them I find they win my heart, even while they are being ham-fisted when it comes to anything sensitive. She certainly knows how to draw a character well and that is something I delight in. The story kicks straight in to the action, showing Mollie and Zack trying to escape the fire, before taking us back six days to the morning where Zack presents his offer. We are introduced to some of the employees of the 57th, named for the regiment Mollie's father fought for in the war-the small business employs fifteen veterans from the 57th, all disabled in one way or another, and all who rely on Mollie for a livelihood. Mollie, Richard and Zack were all likeable characters, backed up by a strong cast of supporting characters, especially Zack's mother and some of the employees of the 57th. The plot was excellent-very fast-paced, with a high level of tension in the scenes between Mollie and the two very different me, but particularly in the scenes during the fire. While it is Christian fiction, the faith elements were very low-key, and I think anyone who enjoys historical romance with a high level of drama would enjoy Into the Whirlwind. One of the best books I've read this year-recommended. Thanks to Bethany House and NetGalley for providing a free ebook for review.